The Empire of China with its Principal Divisions. 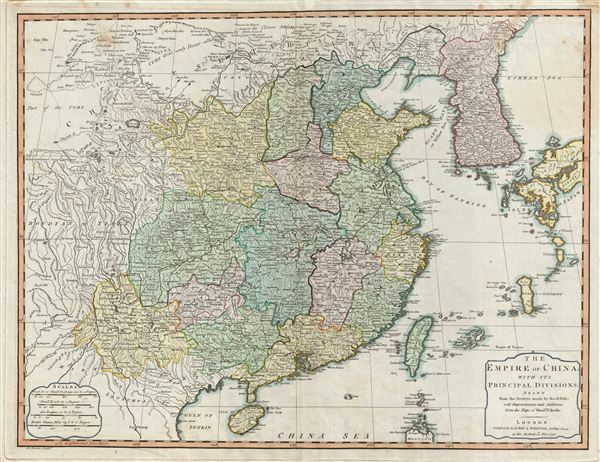 A fine 1794 map of China and Korea by the London firm of Laurie and Whittle. Centered on China, this maps covers from Chinese Tartary to the Gulf of Tonkin and the Philippines and from the Gobi Desert to Korea and Japan. The map includes all of China and Korea, as well as Taiwan and adjacent parts of Tibet, Tartary, Japan and the Philippines. China proper is divided by color coding into various provinces. Several segments of the Great Wall of China are indicated. The sea between Japan and Korea, whose name, either the 'Sea of Korea' 'east Sea,' or the 'Sea of Japan,' is currently a matter of historical and political dispute between the countries is here identified in favor of Korea. Cartographically most of the data on this map is derived from earlier French maps by J. B. B. D'Anville. Stylistically this map presages the functional english school of cartography that would develop in the early 19th century under the patronage of Cary, Thomson, and Pinkerton. This development, of which this piece represents a transitional phase, would do away with many of the decorative embellishments of 18th century maps in exchange for cartographic accuracy and additional detail. engraved by A. Bowen for issue in Laurie and Whittle's 1794 Imperial Atlas. A New and Elegant Imperial Sheet Atlas, comprehending general and particular maps of every part of the world, (London: Laurie and Whittle), 1794. Very good condition. Light offsetting. Original centerfold. Original plate mark. Blank on verso. Rumsey 2310.070 (1804 edition). University of Southern California, East Asian Map Collection (Corean Sea, David Lee Collection, EAMC 155. Phillips (Atlases) 716.